The central part is the main library. The fan shaped part contains lecture rooms and specialist reading rooms. The right hand block is another specialist library and research centre.. 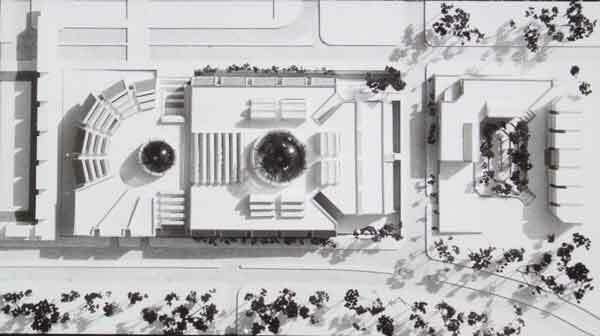 The two domes are covered gardens, reflecting the Islamic notion of the Gardens of Paradise. All areas look inward, onto the gardens. The domes, in shaded glass, are designed to be opened up in the summer, and to be closed in the winter. Each dome is in 8 segments, 4 of which slide open on a circular track. In the closed winter position, the domes provide a protected environment for the gardens. In the open summer position the shaded glass segments overlap, to provide partial shade, and to allow fresh air to circulate. The external walls of the main library are formed in traditional open tile-work screens, allowing light to filter in, while forming a visual protection from the busy city roads outside.